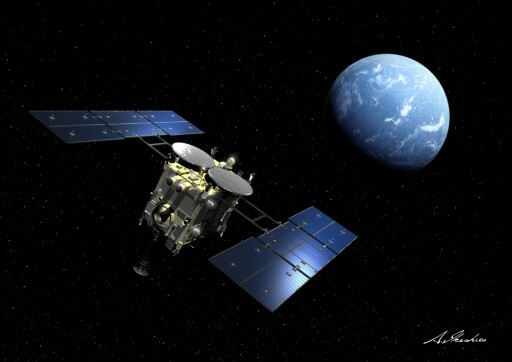 Japan’s Hayabusa 2 Asteroid Explorer is set for a flyby of Earth on Thursday after the first year of its three-and-a-half-year journey to asteroid Ryugu where the spacecraft will complete an 18-month mission that will include the deployment of four small landers and an explosive penetrator as well as a series of ambitious touchdowns for sample collection. 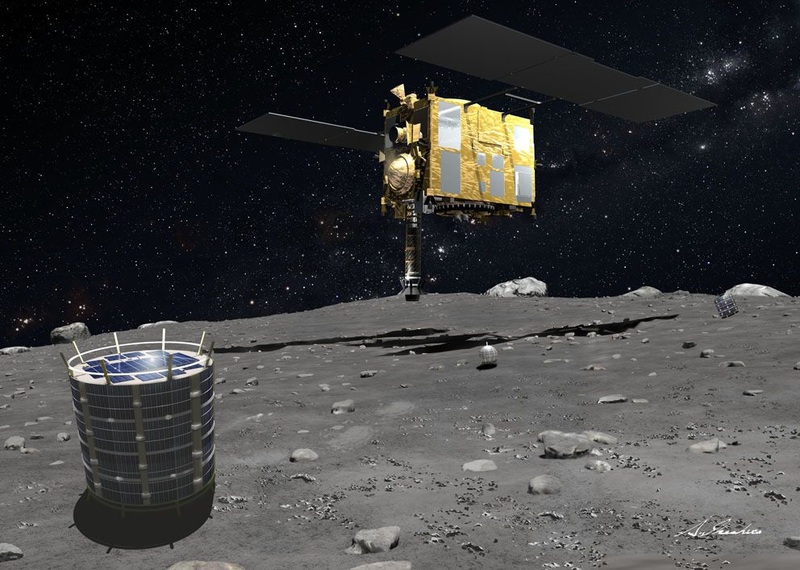 Hayabusa 2 is then expected to make its return trip to Earth for a December 2020 arrival, bringing with it precious sample material that will enable scientists to peer deep into the past to study the formation and evolution of the solar system. The Hayabusa 2 mission began with a thundering blastoff atop an H-IIA rocket on December 3, 2014 – sending the 590-Kilogram spacecraft into an orbit around the sun along with three small payloads setting out to complete very different missions ranging from a small asteroid exploration craft to a piece of distant space art. Once separated from the launch vehicle, Hayabusa 2 settled in for its long journey, first making one lap around the sun before swinging past Earth to gain enough speed to make it to its target, using a set of chemical thrusters and ion engines to optimize its course through the inner solar system. Within the first two days of the mission, Hayabusa 2 completed a series of checkouts and the critical deployment of its solar arrays and the sampling horn that will make contact with the asteroid to scoop up a few grains of material to be returned to Earth. Spacecraft checks including testing on the four landers continued until February and all systems were awarded a clean bill of health. In March, Hayabusa 2 began firing its ion engines to fine-tune its course, already targeting its flyby window. Three of the four engines were fired for 409 hours, keeping the fourth as a spare. 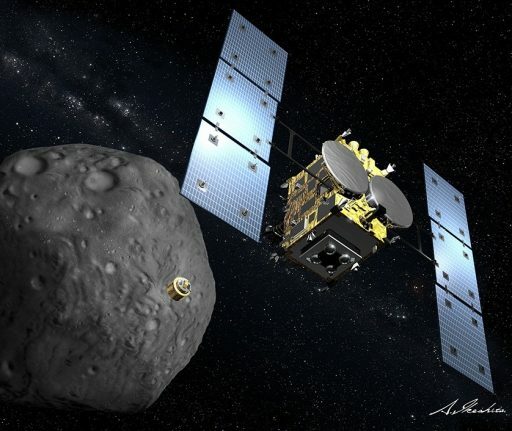 The observed thrust on the ion engines was 28 Millinewtons, an increase over the predecessor mission that visited asteroid Itokawa in 2005 and returned to Earth in 2010 after a seven-year flight. The next round of ion engine operation came in June for a total of 102 hours followed by a 12-hour fine-tuning operation on September 1/2 as Hayabusa 2 was homing in on its precisely calculated flyby path that will give the vehicle just the right amount of additional velocity to place it on its intercept path with Ryugu. The target asteroid received its name in October after having been known under its provisional name 1999 JU3 for over a decade. Ryugu, meaning ‘Dragon’s Palace,’ was chosen as the winner in a naming campaign with over 7,000 entries. Having completed one orbit around the sun, Hayabusa 2 will catch up with Earth on Thursday, making its closest approach at around 10:07 UTC at a distance of approximately 9,500 Kilometers (from geocenter, around 3,000km in altitude). This flyby will slightly bend the trajectory of the spacecraft and enable it to catch up with Ryugu that orbits at 0.96 by 1.42 Astronomical Units around the sun. Hayabusa’s target is about 920 meters across and rotates once every 7.6 hours, belonging to the C-type class of primitive bodies in the solar system, believed to hold a significant amount of organics or hydrated minerals and may have played a role in the delivery of organics to Earth – therefore making Ryugu an exciting target for a sample return mission. Hayabusa’s Earth flyby is a welcome opportunity to exercise the craft’s instruments – a Near Infrared Spectrometer and a Thermal Infrared Spectrometer to capture data of Earth that can serve as an in-flight calibration. 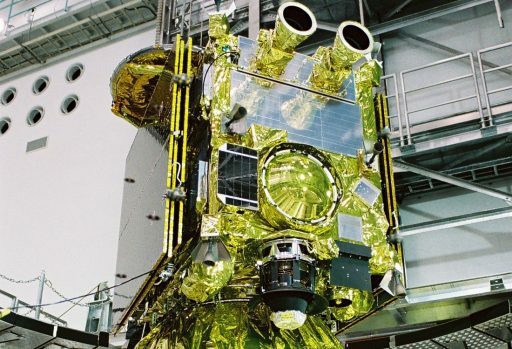 No dedicated science cameras are onboard the spacecraft, but Hayabusa 2 hosts three optical navigation cameras which can capture black-and-white views as well as multi-band imagery and will be used to capture a few views of Earth as part of the flyby. One showing the Earth-Moon system has already been published. Heading back out after its high-speed swing-by, Hayabusa 2 will again transition to coast mode with occasional trajectory correction maneuvers to set up a rendezvous with Ryugu in July 2018 to mark the start of a very ambitious mission that is packed with events to put the various payloads to use. The primary payload of Hayabusa 2 is a sample collection system that will acquire small amounts of surface samples during brief touchdowns of the main spacecraft on the asteroid’s surface using a high-fidelity navigation system that allows the spacecraft to make contact with the surface just long enough to shoot down a projectile that causes an ejection of dust for collection by Hayabusa. Furthermore, the spacecraft will dispatch four landers – the 10-Kilogram MASCOT lander built in Europe for an in-situ study of surface composition and properties, and three MINERVA landers to deliver imagery and temperature measurements. All landers will make several hops across the asteroid’s surface to take measurements at different locations. Another payload of the mission is an impactor device that will be deployed towards the asteroid and uses high-explosives to generate a high-speed impact that is hoped to expose material from under the asteroid’s surface for later collection by Hayabusa 2. A deployable camera will be used to document the impact of the penetrator. After all events at the asteroid, Hayabusa 2 will make its way back to Earth to send a Return Capsule on its way to re-enter the atmosphere and bring the collected samples back to Earth for analysis. 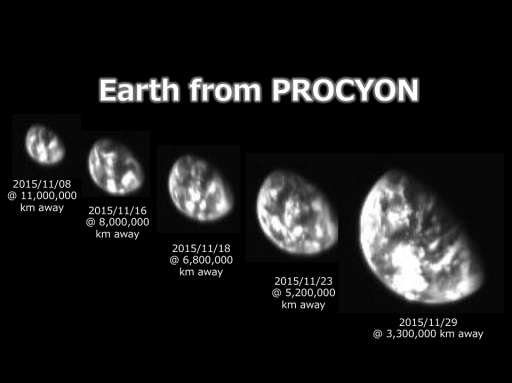 Hayabusa’s smaller companion, the 67-Kilogram PROCYON spacecraft, was not as lucky in its first year of operation. 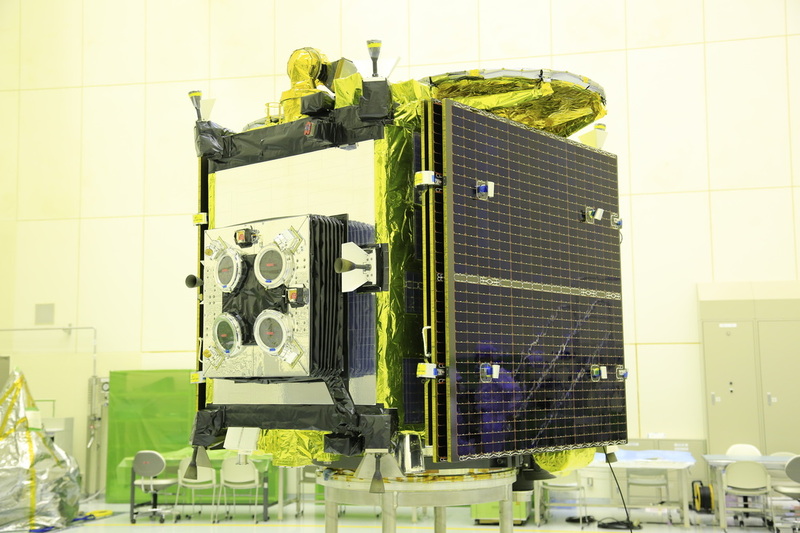 Launched into a similar orbit as Hayabusa, the spacecraft was set for a mission to asteroid 2000 DP107 to demonstrate a small satellite platform for deep-space applications and employ a telescopic imager to capture high-resolution imagery during a flyby of the target asteroid. However, PROCYON’s endeavors of linking up with its target came to an end in April when it was determined that a problem with the ion engines of the spacecraft could not be overcome. Without its ion engines, the small spacecraft will not be able to reach its destination, but the demonstration mission of the satellite subsystems and payload will continue for as long as possible to learn for future missions of similar spacecraft with improved engine systems. 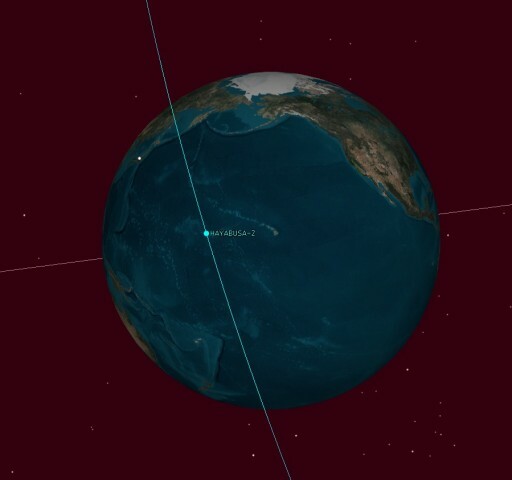 Although PROCYON was unable to finely tune its path for an Earth flyby, the spacecraft will still come within a close distance to Earth on Thursday. This will provide a very good opportunity for testing of the telescopic imaging instrument in a flyby setting somewhat similar to the scrubbed asteroid rendezvous. 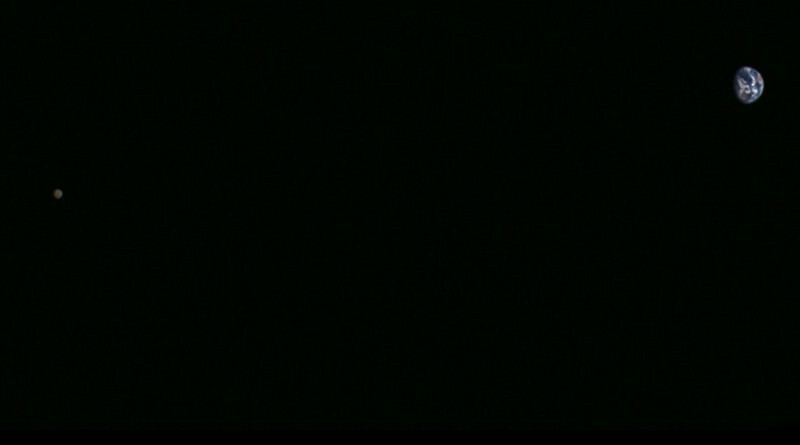 The PROCYON mission already published a number of photos of Earth and the Earth-Moon system as the spacecraft moved in for its pass-by. The other two craft launched alongside Hayabusa 2 are ARTSAT/Despatch and Shin’en 2. Both are without propulsion and will drift past Earth on Friday at a distance of 5.8 million Kilometers in their heliocentric orbits. Despatch is a 30-Kilogram piece of Deep Space Art, consisting of a 3D printed sculpture and tele-creation payload successfully transmitted its space poems to Earth, being received by amateur radio operators. It was successfully tracked out to a distance of over 8 million Kilometers before its batteries ran out. 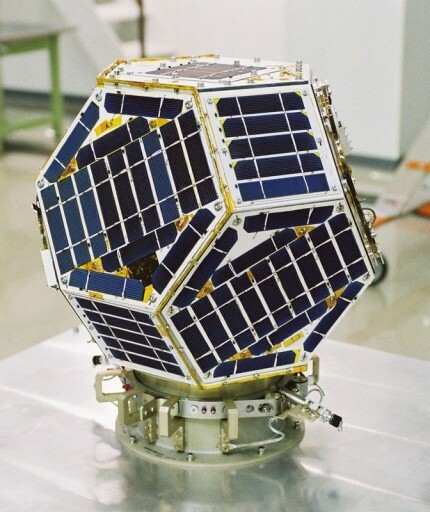 Shin’en 2 has a mass of 17 Kilograms and hosts an amateur radio payload and radiation dosimeter. Its signals were received on Earth and were expected to be readable by amateur radio operators until the spacecraft reached a distance of 3 million Kilometers, further using larger ground stations. 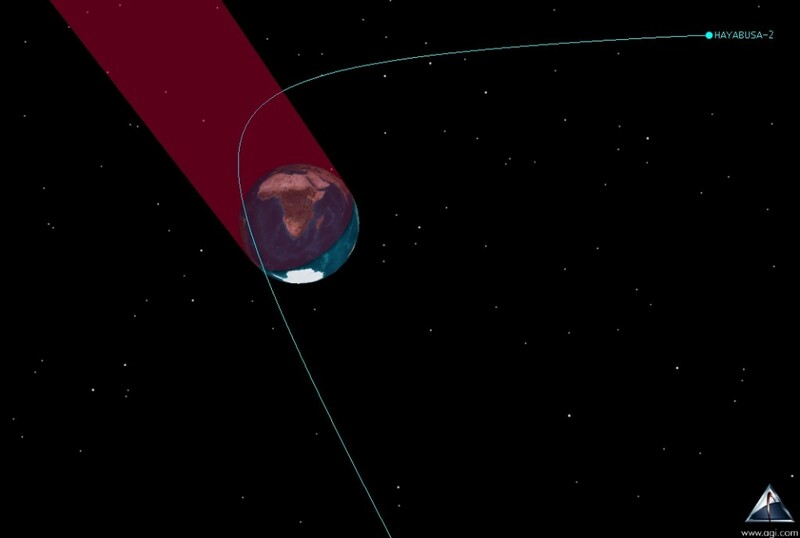 Passing within 5.71 million Kilometers of Earth, Shin’en 2 may be heard again if still operational. Copyright © 2019 Hayabusa 2 | Spaceflight101. All rights reserved.